The shape of things to come in the computer world will be anything but flat, predicts Queen's University Computing professor Roel Vertegaal, who is now developing prototypes of these new "non-planar" devices in his Human Media Laboratory. Not only will they take on flexible forms we've never imagined – like pop cans with browsers displaying RSS feeds and movie trailers – computers of the future will respond to our direct touch and even change their own shape to better accommodate data, for example, folding up like a piece of paper to be tucked into our pockets. "Organic User Interface" – the concept behind these next-generation computers – is featured in the June issue of the Association of Computer Machinery's (ACM) flagship publication, Communications of ACM. The special edition is co-edited by Drs. Vertegaal and Ivan Poupyrev, of the Sony Interaction Laboratory in Tokyo, Japan. "What we're talking about here is nothing short of a revolution for human-computer interaction," says Dr. Vertegaal. He compares our current use of flat, rectangular computers to the 19th-century satiric novel, Flatland: A Romance of Many Dimensions, about people who live in only two dimensions and are narrow-minded as a result. "I think computers are very much like that today," Dr. Vertegaal suggests. "You are essentially looking at a tiny tunnel into a flat, on-line world, and that causes people to think in a two-dimensional way. 'Flatland' interfaces are incredibly limited compared to natural 3D ones." Three recent developments in computer technology have allowed inventors to move beyond the rigid, rectangular design of current devices. Advances in touch input technologies now allow for any surface to sense two-handed, multi-finger touch. An example of this is smart fabric, such as the "tank top" user interface being tested in Dr. Vertegaal's laboratory this summer. The second development, flexible displays, is found in flexible circuit boards with organic LEDs (light emitting diodes) used to make electronic paper. These "E-Ink" (electrophoretic ink) displays are formed from millions of tiny, polarized ink capsules, half black and half white. A computer switch sends out minus or plus voltages and the ink will either attract or repel to form a display. Once the display is "painted" the electricity can be switched off. The flexible base layer allows the display to be rolled up and put inside one's pocket, like regular paper. Kinetic Organic Interface (KOI), the third development, enables the design of computers that adjust their shape according to some computational outcome, or through interactions with users. This is expected to yield "Claytronic" 3D displays capable of displaying not just pictures, but physical shapes in three dimensions. "We want to reduce the computer's stranglehold on cognitive processing by imbedding it and making it work more and more like the natural environment," says Dr. Vertegaal. "It is too much of a technological device now, and we haven't had the technology to truly integrate a high-resolution display in artifacts that have organic shapes: curved, flexible and textile, like your coffee mug." 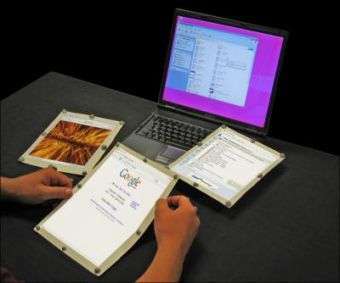 -- The world's first completely foldable paper computer, which allows users to move up or down in a document by folding or turning the pages – a much more natural experience than using a laptop. 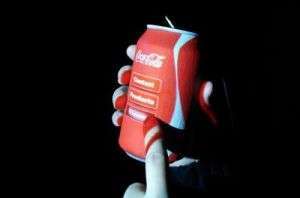 -- An interactive Coke can with a cylindrical display that plays videos on its surface and responds to touch. All the electronics can be detached and recycled separately from the aluminum. -- A work bench for gadget design that simulates a real computer on ordinary objects of arbitrary shape, like a sheet of paper or a piece of Styrofoam. When displays are projected onto the surface of the paper or Styrofoam, it instantly becomes a computer. The third project is useful for the design of new gadgets, but could also allow hardware to be downloaded from an on-line store, avoiding the wasteful purchase of new atoms, Dr. Vertegaal notes in his article. "That would be a final frontier in the design of computer interfaces that turn the natural world into software, and software into the natural world."